Brig. 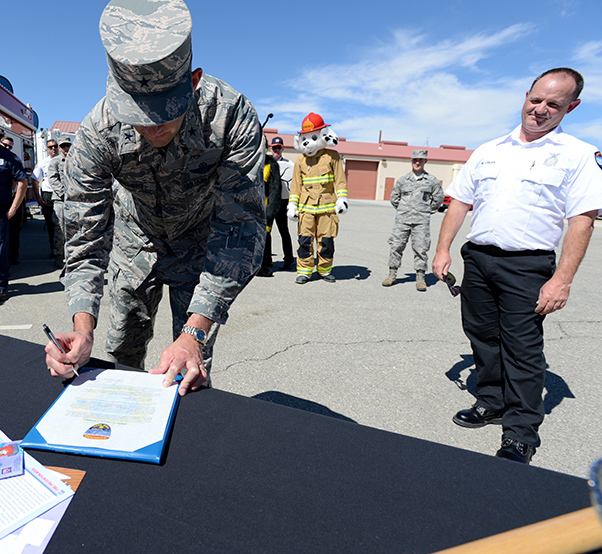 Gen. E. John Teichert III, 412th Test Wing commander, signs this year’s Fire Prevention Week Proclamation as Mike Pinan, Edwards AFB Fire Prevention assistant chief (right) watches, Sept. 25. The general signed the proclamation while visiting with the 812th Civil Engineer Squadron. 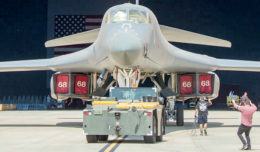 The Fire Department at Edwards Air Force Base, Calif., is teaming up with the National Fire Protection Association — the official sponsor of Fire Prevention Week™ for more than 90 years — to promote this year’s Fire Prevention Week campaign, “Look. Listen. Learn. Be aware. Fire can happen anywhere™.” The campaign works to educate all Airmen, military and civilian, and their families about basic but essential ways to quickly and safely escape a home fire. Brig. 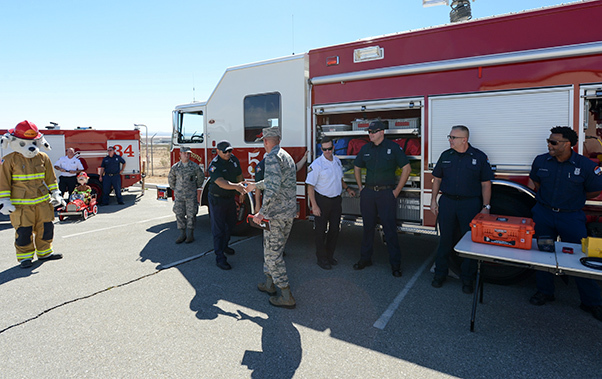 Gen. E. John Teichert III, 412th Test Wing commander, meets with members of the Edwards AFB Fire Department Sept. 25. 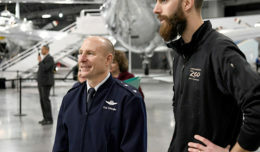 The general was given an immersion tour of the 812th Civil Engineer Squadron, which includes the fire department, Emergency Management Flight and Explosive Ordnance Disposal Flight. * Listen for the sound of the smoke alarm. * Learn two ways out of every room. While NFPA and the Edwards AFB Fire Department are focusing on home fires, these fire safety messages apply to virtually anywhere. No matter where you are, look for available exits. If the alarm system sounds, take it seriously and exit the building immediately. * Oct. 10 – Information and handouts at the Exchange from 10 a.m.-2 p.m.
* Oct. 10 – Open house at Fire Station 2, Bldg. 5560, on Forbes Ave from 5 p.m.-7 p.m.
* Oct. 11 – Open house at Fire Station 4, Air Force Research Laboratory, 9 a.m.-2 p.m.
* Activities throughout the week at the schools and Child Development Center.